HAMPTON, Va. (November 10, 2018) – The Hampton University Office of Admission welcomed over 1,500 high school students, parents and guardians, including 101 students who were invited to the Honors Visitation program, during the 2018 Fall Open House on November 10, 2018. Prospective Hampton University students, parents and guardians began the day with a formal welcome in the Hampton University Convocation Center from HU Administrators, members of the Student Recruitment Team, newly crowned Miss Hampton, Ludgwidg Louizaire, and Hampton University President, Dr. William R. Harvey, where he thanked parents on their willingness to attend this event. The day also included a guided campus tour for all attendees, as well as student and parent panel discussions. An Academic and Administrative Services Fair hosted in Hampton’s three-story state of the art Student Center allowed the prospective students, parents and guardians to meet representatives from all academic departments plus Residence Life, Freshman Studies, Honors College, Student Financial Aid and other student services departments. 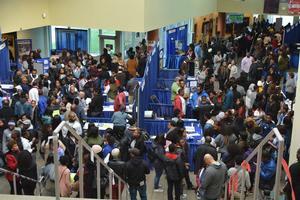 The annual Open House is organized by the Hampton University Office of Admission. “I think that people are pleased with what they’ve seen thus far, and I think they are pleased with the organization of it. I think they are impressed by our students, and they are excited about the future for their children,” said Angela Boyd, Hampton University Dean of Admission.